The first solution for developing under .NET umbrella of technologies for Android has arrived and now, if you're proficient in .NET/C#, you can use those skills to bring your apps to Google's mobile OS. Mono for Android by U.S. software house Novell includes a software development kit with all the tools for coding, debugging and deploying apps, as well as the Mono runtime, native Android APIs bindings and a Visual Studio 2010 plugin, so you won't even need to change the IDE. This should translate into an almost flat learning curve, but before you start itching to code, let us break down the prices for this luxury: $99 for Mono's Student edition, $399 for Professional, $999 for Enterprise and $3,999 for Enterprise 5. A free trial version will let you make up your mind before you buy. 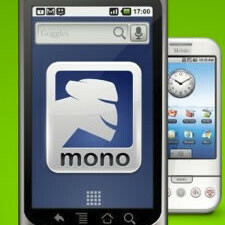 A Mac version is also available, while Mono for Android on Linux is planned for a later release. Now, using Mono – of course – doesn't mean that you can simply rebuild your Windows Phone 7 app as the UI and hardware are managed differently, but it does mean that you'll only need to rewrite a limited portion of the code. So some of those 13,000 Windows Phone 7 apps out there could be transferred to Android much easier. Pretty neat, isn't it? Oh great... Like we needed more vunerable software on the Android. I don't know how the .net framework works on a Linux platform, but it is full of holes on Windows. Lookout Mobile Security and AVG will be your best friends for this, but not so much for your phone's battery life.